Doom Patrol: Read This Too! So we've had this fun conversation bouncing around the Blogosphere about propping up the readership of some of our favorite, but less followed titles. I struggled with this one quite a bit. If you check the sales info month in and month out, there really aren't a whole lot of titles that fare more poorly than our pals in the Patrol. I read so many darn books each and every month, that I really had to stop and think a long time about what books I would get if I weren't doing reviews. I know I'd be buying Booster Gold and Zatanna, but I have a little more to say about those two over at Tornado's Path. I'd also be buying Atlas, but that ends this week. I'd be getting Birds of Prey, regardless of any Brightest Day connection, simply because Hawk is one of my favorite comic book characters. Brightest Day is on the list. After that, however, the list of what I absolutely, positively must be is pretty thin. There are two standout ongoing series that would make the list, and would be among the Top Three on my list if I were to run through the exercise of numbering my absolute favorite comic books. I'm not going to do that, but I am going to share both of them with you here and implore you to check them out. Marvel's Hawkeye & Mockingbird is one of the first titles that came to mind. Hawkeye was always around the Avengers when I started reading that title, and soon thereafter he moved west and claimed a team of his own. 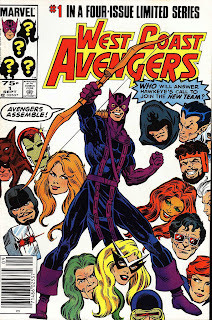 As years passed, Hawkeye became a character I found myself caring less and less about, until he "died" in Avengers Disassembled. When he came back as Ronin, I was non-plussed, and kept an eye on his adventures, but never put any coin in them. Then the announcement came through that there would be a Hawkeye & Mockingbird title as part of the Heroic Age that followed Dark Reign. Better still, it was going to be written by Jim McCann. I have to admit, I'd only read a story here or there from McCann, but the man had impressed me when I met him in Chicago in 2006 while he was working as Marvel's Marketing Manager. I decided to make a mental note and check this book out. This is one of the most enjoyable reads that hits my reading stack month in and month out. The title is only four issues old, with number five hitting the streets in a matter of weeks here.Of the four issues that have been released, all have been reviewed by my Comic Book Resources and myself. The lowest the title scored was three stars out of five. More than once it has garnered 4.5 - by two different reviewers! To this point, the entire series has focused on Hawkeye and Mockingbird reestablishing their relationship, but they encounter some difficulties with that in the form of Phantom Rider and Crossfire. This comic is fun superhero adventuring with an Avengeriffic twist that is able to stand all on its own. It's not Doom Patrol, but it is a fun, crisp read that consistently delivers month in and month out. 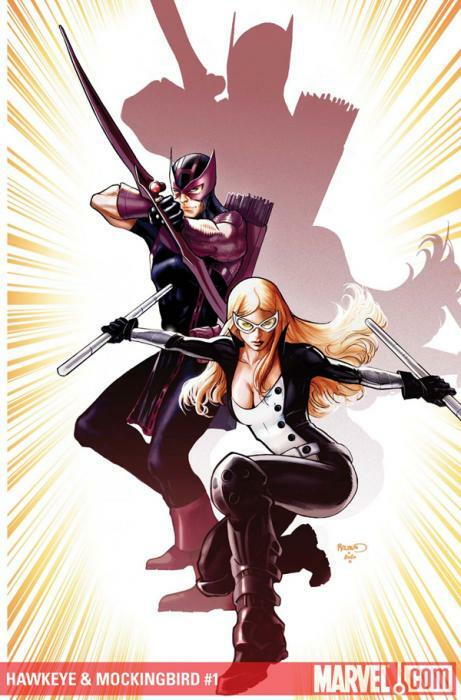 Finally, after seeing the new solicitations strathcona asked "Is 'Hawkeye & Mockingbird' canceled? Not is it on hiatus, or 'we'll see after Widowmaker is finished'... at the Marvel offices, is the book considered canceled or not? 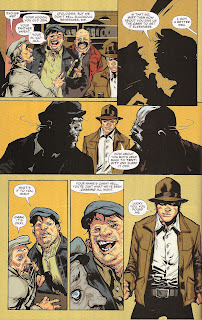 Brevoort: Is it cancelled? No. Is it going through some changes? Yes. Might it be cancelled in a little while? That's always a possibility, I'm not going to lie to you. But right this moment, there's more to come after Widowmaker from those characters and that creative team. I also thought about pimping up Freedom Fighters. Palmiotti and Gray are among my favorite writers right now, stemming back to their work on Hawkman and Monolith. On panel at the Baltimore Comic-Con this year, Palmiotti warned attendees to avoid this book if they didn't like reading. While only the first issue of Freedom Fighters has been released, it was filled with more story than multiple issues of many other titles. It's quirky and offbeat and will make a nice addition to plug that Atlas-sized hole in my reading each month. Ultimately, the title I decided to really promote, though, is American Vampire from Vertigo. One of my absolute favorite titles in recent memory is Blue Beetle. 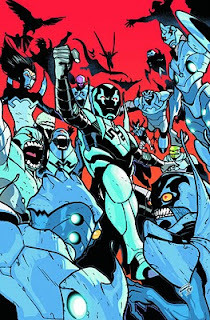 Yes, Jaime Reyes. Keith Giffen, John Rogers, and Cully Hamner really brought their A-game with this character, but the book really caught fire for me when Rafael Albuquerque took over on art. Albuquerque jumped in and made Blue Beetle his own while remaining respectful of the designs Hamner crafted. Once that title ended, Albuquerque drifted around, doing some single issues, occasional storylines, and covers. Then it was mentioned that he'd be working on a new Vertigo series. Something about vampires. With some writer named Stephen King. Oh yeah, this was Stephen King's first original comic book work and he would be fleshing out characters and concepts with his co-writer and creator of American Vampire - Scott Snyder. Snyder and King handled the first five issues as a split book. The first story, written by Snyder focused on Pearl Jones and her adventures in adventures in California during the 1920s. Pearl's adventures there would lead her to encounter Skinner Sweet, whose story was penned by Stephen King and featured the evolution of a species - the American Vampire. Albuquerque has illustrated all of this title to date - six issues - and shows absolutely no sign of slowing down. Making it even better, Albuquerque uses a different style for each era of the story. Sweet's origin is rendered in a decidedly different style - but still recognizably Albuquerque - than Pearl's story. Issue #6 is drawn differently still as the scene shifts to Las Vegas in its early days. This book has become one of my favorite titles month in and month out. King was only onboard for the first five issues, but I honestly find Snyder's work compelling enough in its own right. Sure, it's nice to say you're reading an original Stephen King comic, but it's nicer still to read a comic that is original, classic, exciting, and just so happens to have some parts written by Stephen King. Issue #6 was released recently, written solely by Snyder. Additionally, the title maintained its $3.99 pricing. 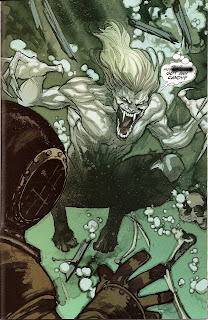 To further stack the deck, Snyder changed locations, moving forward in the history of the American Vampire. Frankly, this issue is one of the most enjoyable and compelling to date. I find myself enthused about this title, a title I probably would have (hideously) overlooked had it not been for the artwork of Rafael Albuquerque. Albuquerque is a modern master on the ascent. He can shift gears like no other and doesn't hesitate to bring his absolute best each and every issue. I would pay $3.99 each month just for Albuquerque's art. Of course Snyder's anything-can-and-often-does-happen stories bring some wonder to this title. All six issues of this title have been reviewed over at Comic Book Resources, where it has earned 4 stars (out of 5) only twice while garnering 4.5 stars for the other four issues. Month in and month out, American Vampire delivers a comic that is sassy and savage, exciting and exhausting. This Read This Too! event happens at a spiffy crossroads for American Vampire. This week sees the release of the first hardcover collecting the first five issues, with some bonus extras, and priced at an affordable $24.99. To make things even better, and much more convenient for those of you thinking about jumping on board, issue #7 comes out next week. I'm sure you might be resourceful enough to find yourself a copy of issue #6. If not, let me know. As a matter of fact, let's have some fun with this. The first two emails that I receive with a photo of you holding the American Vampire hardcover will receive a copy of American Vampire #6 in the mail. I cannot guarantee that the copy of #6 will reach you before American Vampire #7 hits the stands, but there you have it: free comic. Unfortunately, due to budgetary concerns, I'm going to restrict this to the United States only and only for readers who are over eighteen. American Vampire deals with some adult situations and it doesn't pull any punches in doing so. So there you have it, check out American Vampire. Buy the hardcover, send a photo of you with said hardcover to mygreatestadventure80@gmail.com and get a free copy of issue #6. Just like that you'll be caught up on one of the greatest reads on the new comic racks today. Honorable Mention: Taking the consolation prize in this Read This Too! is another title I cannot recommend more highly. The Stuff of Legend, published by Th3rd World, features the story of a set of toys set out to find their boy. Yes, I thought it sounded overly like Toy Story when I first read about it too, but it's not just a Toy Story knockoff. 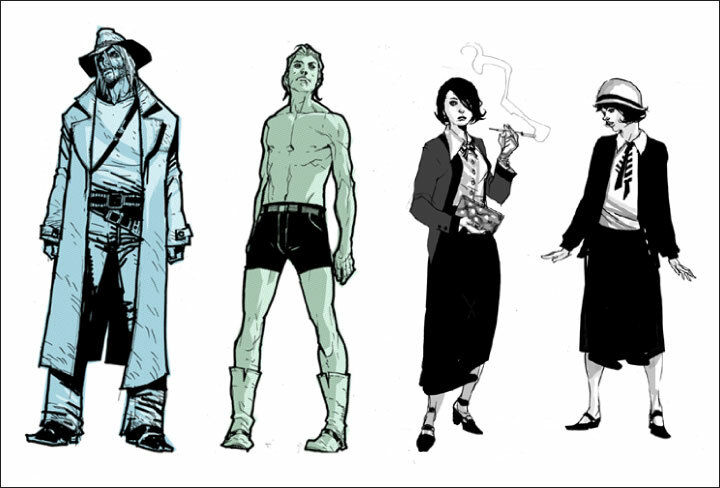 Stuff of Legend is a tale with the heart of Toy Story, the brains of Starman, and the sense of adventure of Drake and Premiani era Doom Patrol. It's written by Mike Raicht and Brian Smith with incomparable art by Charles Paul Wilson III. I almost shilled for Hawkeye & Mockingbird too, but when I looked at the charts, it was doing pretty well already. Which is the awesome. American Vampire has two things I don't care about - Stephen King and vampires - but you make a good case for it. And the art looks great. I'll look into it. If the Stephen King aspect is something that doesn't appeal, maybe issue #6 would be a good start. That issue is scripted solely by Snyder and it starts a new storyline that will tug out some threads of the previous story. I'm not AGAINST King by any means, just not attracted to his stuff. It's not a deal breaker ;). I was looking forward to Hawkeye since his death. It has been great so far, but the sarcastic bowman is one of my favourite Marveol dudes ever so I'm a little baias! Blue Beetle I will be looking into though! I'm not familiar with 'American Vampire' but it looks interesting. The illustration looks tops too! May have to track it down. I am not a big vampire guy (I like Frankenstein's monster and the Mummy a lot more), but American Vampire is the sort of book which sounds like it will appeal to my brother, a fellow gorehound like myself. I like that Snyder is taking things in his own direction and not just there to ghost-write King. And the art looks fantastic! Doug - Nice reviews! I've been contemplating picking up the Hawkeye & Mockingbird series. You may have just sealed the deal for me. Vampires aren't really my thing, I leave those to my wife mostly. However, you make a compelling case. I may have to check out American Vampire. Also, with DCs new price reduction starting in January it's a little more affordable. Finally, Fhe Stuff of Legend sounds and looks great! Out of all the books you talked about, this one has caught my interest the most. The "Read this too" event has been great for discovering new books! Thanks for the excellent suggestions! Beast Boy at Dragon Con!